Etiology: Hereditary mandibular prognathism is due to an autosomal recessive trait with incomplete penetrance. Diet may also be a factor in the initiation of the condition . Incidence: The incidence of malocclusion is moderate. Clinical Signs: Signs of improper occlusion of incisors are apparent on physical exam by 3 weeks of age. The rabbit may present with poor body condition and/or poor growth rate. Diagnosis: Diagnosis is made by performing an oral examination. 1. 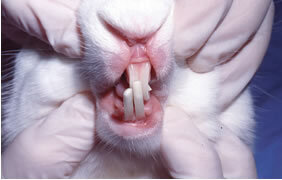 Okuda, A., et al., Comparative observation of skeletal-dental abnormalities in wild, domestic, and laboratory rabbits. J Vet Dent, 2007. 24(4): p. 224-9.